Signs of Frustration. Mine not Hers. First a little background. As long as 10 years ago, a neighbor down the street sent a message to everyone on our street asking us not to put our yard trash on the street until near the time of our weekly pick up on Thursday. Kate was initially offended by it but has tried to abide by the neighbor’s plea. In the past couple of years she has been especially rigid about it, not wanting to put the trash out until Thursday morning. I have never cared for this because it meant that we (either Kate or I) had to be the ones to get it out because the woman who cuts the grass and cleans up the flower beds wouldn’t be here early enough on Thursday and often comes on Tuesday or Wednesday, sometimes Friday. She came on Thursday morning this time after the trash men had already picked up. The leaves are beginning to fall, and the trash piled on the street was at least 12 feet long. This is not a good week for this to occur because today is Halloween. We have a lot of trick-or-treaters. Kate wanted all the trash moved. I originally suggested that we leave it, but she was insistent. It is also something she didn’t forget. I never volunteered to move it, but she got the impression that I had said I would. After lunch today, she said she would meet me outside which I took to mean that we would work together to move the trash to the back of the house. When we got out there, she began raking up some trash that was in the yard. I started to load up the trash in an old garbage cart that I could roll to the back of the house. It turned out that she wanted me to put it in the flower bed on the side of the house. This is one of the areas that I have had our yard person cleaning up. To be more specific some of this trash has come out of the flower beds, and I didn’t like the idea of putting it back just after she had removed it two days ago. She said she would step aside, and I could put it wherever I wanted which I did. She started picking leaves off the shrubs she does almost daily. As I was taking one load of trash to the back of the house I noticed that she had left some trash from the front flower bed on the sidewalk, a place she usually put trash. I suggested she could clean that up while I was moving the trash from the street. She seemed quite willing to do it. I saw her with a broom, and she was sweeping the front porch. It had looked pretty clean to me, but I thought she just wanted to start there and then move along the walkway to the driveway. Later I walked by and saw the trash was still on the walkway. It turns out that she had finished her work and gone in to take shower. I ended up cleaning up that trash too. At the time I felt like saying something to her but decided against it. I know that she didn’t realize what she had done (or not done). I simply didnt think there was anything to gain by saying something other than the personal satisfaction of telling her. I relay this story to make sure that the reader knows that I do experience some frustration even when I accept what she has done or not done. It is also another example of how this disease can change normal interaction. There are many things like this that occur, but I try not to say anything at all. Something else that bothered me. I changed clothes before going out to clean up the trash. She is not sensitive to this at all. She was dressed very nicely when we went to lunch. I commented on how nice she looked. She wore a beautiful garnet turtleneck sweater and a nice pair of black slacks. When she went to clean up, she wore those same clothes. At one point I saw her sitting on the edge of a flower bed where she was pulling weeds or something like that. She has so few clothes that are not soiled in any way that I hate to see her messing up the ones that are in good shape. Yesterday afternoon Kate worked in the yard. I called her in about 45 minutes before I felt we needed to leave for dinner and the concert. I had told her a little earlier where we were going. I reminded her when I went out to get her. When she got dressed, she was dressed more informally than I thought she should. She asked me if she met my approval. That led into a comment or two about where we were going. She hadn’t remembered at all. When I reminded her, she felt she should change. Even though I believed she was dressed too informally, I told her she was all right. She could tell my heart wasn’t in it. Ultimately, she changed, but the top she was wearing was soiled in several places from cosmetic stains. Later I noticed that her slacks were also soiled. That reminds me that something new is that she is beginning to make a habit of asking me about the clothes she wears when we are going to something a little more special like last night. She did not do so last night, however. It is clear that she is releasing her independence a bit by soliciting my opinion on her clothes. She also commented to me this week that she wants to please me. This came after she had gotten ready on time when we were going someplace. For some time I have been aware that Kate seems somewhat less secure in social situations than she used to. I don’t mean that she verbally expresses any stress but that she seems not to talk as much. I attribute this to her not remembering many things. In addition, she has difficulty explaining things are describing events. More recently, however, I am seeing increasing signs. Today, for example, we attended a PEO book chat. Although she clearly wanted to go, she didn’t make any effort to get herself ready until I prompted her to do so. As it turned out, we were 20 minutes late. While we were there, she greeted people, but she was mostly somewhat removed from conversation. I just think it is too hard for her. In one instance, I got into a conversation with a women from whom she buys cosmetics. We talked for at least 5 minutes while Kate stood about 10 feet away by herself, apparently waiting for me to finish. Looking back I think she may not have recognized the woman. Go to and coming from the event, Kate told me several times how much she appreciated my going with her. This is really the thing that makes me feel she is having some insecurity in such situations. Just before we got in the car a woman from UT called to Kate, and they talked a few moments. When they had finished, she asked me who that was. I told her that was one of the people with whom she worked on the PEO grant program. Kate and I were driving away from our house shortly after 10:30 this morning when we saw our next door neighbor walking to her car from the house. She has had significant flood damage from our recent storm; so I asked her how things were going. After she told us, she asked if we were still on for dinner at Casa Bella tomorrow night. We said yes. Then we drove over to Panera for Kate to get some lunch before I went to a luncheon at the foundation. While we were at Panera, Kate told me she had seen our neighbor this morning and that they were looking forward to going with us to Casa Bella tomorrow night. It is possible that she actually had seen the neighbor earlier; however, I know she had not been out working in the yard this morning. That makes me think she forgot that we were together when we saw her. This is not the first time I have heard her tell me something like this though I think it is the first time I have reported it. I got home a short time ago from donating platelets. It had been almost 4 hours since I left the house. Kate had been outside working in the flower beds at least 30 minutes before I left. I stopped as I drove in the driveway where she was working and asked if the heater man came while I was gone. It was a dumb question as I knew that he was on the way when I left. In addition, I called the company as I was leaving the Red Cross to give them my credit card information to pay for the services. In other words, I knew that he had been here. When I asked Kate the question, she looked puzzled and said, “I don’t know.” Then she asked me what he was doing. I told her he was here to fix the heater. (We had not had heat since returning from Memphis. The weather had not required heat or cooling until today when it was 38 this morning after 40 degrees the previous morning.) She looked puzzled again and tried to think. I told her I knew that he had come, and that I had talked with the office. She then said, “Yeah, I let him in the back.” This is another example of how faulty her memory can be and/or how little attention she pays to things. I believe both things are happening all the time. The important part of this is helping me try to understand how she must be feeling about things. She must feel less and less a part of things going on all around her. It is a withdrawal from life that I am witnessing. Some of this keeps her from feeling a sense of anticipation about doing different things. Although I knew she wanted to attend Tina’s granddaughter’s wedding, she expressed very little enthusiasm as the time approached. In fact, I had no sense that she was ever thinking about the wedding except when I mentioned it as I did frequently. Earlier today it dawned on me that I don’t believe I have mentioned anything (or much) about Kate’s moving things that are mine and putting them in places where I can’t easily find them. This morning I was looking for a box of business envelopes that I bought 6-8 weeks ago. I was replacing some that I used to keep here in a drawer in the kitchen (which subs as my office). They disappeared so I bought a new box. When I opened the drawer, they were not there. I went to Kate and asked if she knew anything about them or where I might look to find them. She had absolutely no recollection of them at all. I went to her office and started looking in places that I thought she might have put them. I opened a draw of a table that is by her chair in her office. I found a stack of envelopes that had disappeared earlier; so I took what I needed. I didn’t even try to explain that I didn’t find the ones that had just disappeared but the earlier ones. I simply said that I had found them. This is just one of a number of instances in which she has moved things that are mine. Last night was our first meeting of the new year for our music club. Kate had been resting for an hour or so when I reminded her about the meeting. She was very lethargic. It was clear that she was not eager to attend. I asked her if she would like to stay home. She said no. At the social hour after the meeting, she seemed to be alone a good bit, but she did talk with several people including the pianist who performed for us. When we got home she said how much she had enjoyed being there. Fortunately, it appears that she gets some pleasure out of the activity of doing things like this even when she doesn’t want to do them in advance. I have noticed this on quite a few other occasions. Kate and I came over to Panera about 20 minutes ago. Since returning from Memphis on Wednesday night, we have not had heat or air conditioning in the house. The “motherboard” that controls the system went out. The company that services our heat and cooling has ordered a new one, but it has not yet arrived. That leads me to explain how we happened to come to Panera this afternoon. We had been out at lunch, then to Belk’s to buy Kate new shoes and new socks for me, and then to Lowe’s for more plants before returning home. When we got back home and unloaded the plants from the car, Kate remained outside for a while. I had noticed that it is warmer than usual in the house. Not really bad in terms of temperature, but feeling warmer without the air conditioning. When Kate came inside, she was hot. She found the inside intolerable. For quite some time, perhaps 3 years or so, she has been sensitive to heat and cold. In either situation, she wants it resolved quickly. She literally groans. If someone else were to hear her they would think she is in agony. I guess she really is in terms of her perception. Anyway, I suggested that we come over to Panera where we could sit in air conditioned comfort and get something to drink as well. She gladly accepted; so here we are. We looked around for a good seat. I finally suggested the small booth we are in because it seemed to be out of the direct sun which neither of us likes. She concurred. Then I walked over to a store in the same shopping center to buy an HDMI cable to connect a new TV in her room to the cable box. When I got back and sat down with her, I said something about our sitting in a good place that was one of the cooler spots because we were not in the direct path of the sun. She said, “That’s why I chose it.” I just smiled. I didn’t remind her that it was I who had selected this table. It is hard to depend on anything she says. This is just one example. While she was trying on shoes at Belk’s, she said she liked a particular shoe. A few minutes later, I showed it to her again. She said she didn’t like it. This kind of thing goes on all the time. She says she likes or dislikes something only to contradict herself sometimes only moments after expressing her original opinion. Like most things she does, it is a small, unimportant matter. I only mention it to document this particular habit. Last night Kate and I returned home after 9 nights away. Our timing was good. Unfortunately, we found that the HVAC is not operating at all. I called the service company. They are sending someone to the house between 4:00 and 6:00 this afternoon. This was a relaxed but busy trip. We first stopped in Nashville where we had lunch with our friends, the Davises. Then we went to Memphis where we spent three nights with our daughter and her boys. Then we drove to Helena, Arkansas for the wedding of Kate’s cousin’s granddaughter. We spent one night there. After the wedding reception we stayed three nights with our longtime friend Dorothy Hinely and her husband Mitch. We came back to Jesse’s house for one night. Yesterday morning we left for home. We stopped in Nashville to visit with Ellen in her new apartment (assisted living). She looked great but is still have difficulty with her speech. We visited for an hour and then drove on home. All that description is a preface to my observations regarding Kate’s adjustment during the trip. First, I should say that she had a great time. We repeatedly talked about what a good time we had had seeing all the people and enjoying the scenery and the home and grounds of the Hinelys. Seeing Ellen was also a special pleasure, not to mention the excitement of the wedding and the pleasure of seeing our daughter and her boys. The downside is that too much happened too quickly. It led to a bit more confusion for Kate though it did not seem to diminish her pleasure. Some things were similar to what we experience while at home. For example, I pointed out a stone wall near Dorothy’s house. Kate immediately said she noticed it every time we went by it. This was the first time we had driven by this area. Other things were somewhat different. Here are a few things that were evidence of her confusion. 2. We were moving from one place to another so much that she couldn’t recall where we were or when or where we were going. Several times she asked if we were going home today. 3. The second morning we were at Dorothy and Mitch’s she left Dorothy and me in the kitchen after breakfast. We talked an hour or so. Then Dorothy wanted to go upstairs and get her shower, and I wanted to check on Kate. When I got upstairs, I looked in our room, but she was not there. I walked out of the room and saw Dorothy who was coming up the stairs. I looked in Dorothy’s room and noticed that Kate was in Dorothy and Mitch’s bedroom resting in their bed. We lowered our voices so as not to disturb her. She heard us and said, “You don’t have to lower your voices. I’m awake.” She continued to rest. Dorothy asked Kate if it would bother her if she went ahead and showered and dressed. Kate said no. In a few minutes Kate came into our room and got into bed. I don’t know if she ever realized that she had been in the Hinely’s bed. Dorothy and I never said anything to her. She never said anything herself. It would not surprise me if she had not realized it. 4. We stopped at Cracker Barrel for lunch yesterday. When the two of us went to the receptionist’s stand, she told us there would be a few minutes wait. I gave her our name, and she said she would call us. I told Kate and the hostess that I would be in the men’s room. Kate looked as though she were going on into the dining room. I motioned to her to wait and went to the men’s room. I figured she would walk around the store to look at the various items for sale. When I returned, I didn’t see her. Then the hostess called us. I asked if she had already seated my wife. She said that she hadn’t. We walked in the dining room and I saw Kate standing at a table waiting for me. It turns out that she had simply gone in and taken a table when I left for the men’s room. The hostess, who had planned to take us to another table, then told Kate she shouldn’t have taken a seat without going through her. 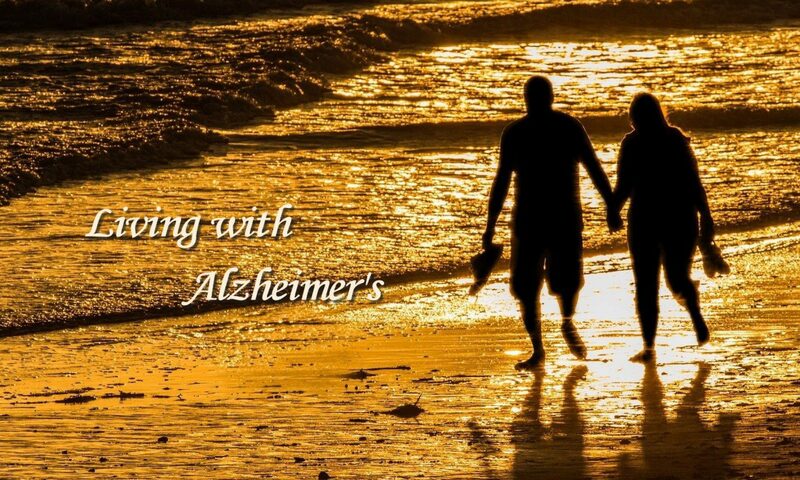 As she walked away, I tapped her on the shoulder and explained that Kate has Alzheimer’s. Then she felt bad. I was afraid she was going to make a big deal about it. It was the first time I have felt the need for a card like the one that Kate’s cousin had. It said something like, “My husband has Alzheimer”s. Please understand if he says or does something that you think is out of place.” I may have to start preparations for such a card. There were numerous other examples of confusion that occurred during the trip. I felt sad for her in that she must have felt tossed about without knowing where we were going, who we would be with, what we were going to do, how long we would stay. It must have been overwhelming. On the other hand, I really believe she had a good time, but it makes me think I will need to be careful in planning our trip to Texas in December. I know, however, that we need (I want) to see several people before she declines any further. I may just have to take the risk. I should also add that she did take rest breaks whenever it was possible. Even at Jesse’s, she went up to the room and stayed there for a couple of hours when she could have been downstairs with the children. That says a lot about her need to get away from situations that may be taxing her brain. We spent a delightful morning and early afternoon with Tina driving to a beautiful park and having a picnic lunch. After dropping Her off at her place, I decided to check out the directions to the reception. We are back at our B&B and will stay here for a while before going to the wedding at 4:00. Kate has been tired most of the day. The primary indicator has been that she has been rather quiet with Tina. She has been almost completely silent with me. She has acted like she is very bored. Earlier today when we were going to get Tina, she asked me where we were going. I told her, and she asked, ”And then are we going home?” I reminded her that we would go to the wedding and then to home of the groom’s parents for the reception. She seemed disappointed that I didn’t say that we were going home. While on the drive to reception, we approached a rock wall similar to those in New England. I pointed it out to Kate. She said, “I notice it every time we drive by it.” This is the first time we had been anywhere close to this spot. Another Deja vu experience. When we sat down in the living area of our B&B, she asked me where we were going from here. I told her to the wedding and then to the reception. She made no response. She is lying down beside me on the sofa resting. I plan for us to remain here for another 10-15 minutes. Then we will go on to the wedding. Her being so tired makes me wonder about our cruise for next May. I think going all that way to Europe for a cruise may not make any sense if she needs to rest most of the time. Kate and I are staying in a B&B in Arkansas, where we are staying in connection with a wedding of Kate’s cousin’s granddaughter this afternoon at 4:00. We got to bed around 10:30 last night. Kate has had a hard time getting up. I started waking her up just before 8:00. I finally went down to breakfast at 8:30. I came back, and she was still in bed. A while ago I told her we needed to leave. She is just now getting up. Now I need to finish getting ready myself, but I wanted to note that I am observing more signs of her being worn out. This seems to happen when we are out of town and stay up later than usual. She also didn’t have time to rest much yesterday afternoon although she did take a 20-minute nap/rest.